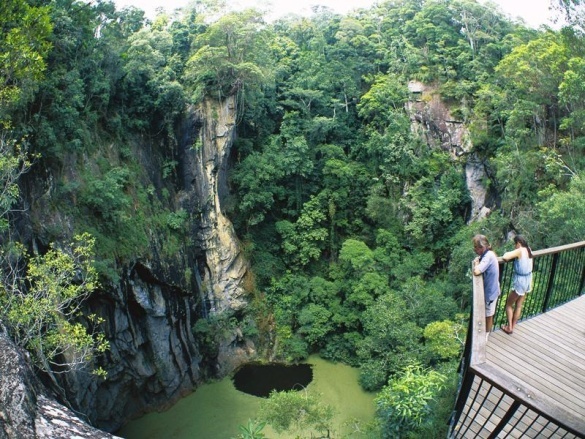 The Atherton Tablelands is located 90kms south-west of Cairns. It ranges from 500m to 1280m above sea level and covers 620km² with a total population of approximately 45,243 people. The Tablelands is renowned for its mild tropical climate and is spared the climatic extremes of floods, droughts and destructive cyclonic winds. Its pleasant temperatures range between 17°C and 25°C from September to June and between 5°C and 14°C from July to August. The region enjoys cool summer nights and mild, sunny winter days and does not suffer from the high humidity experienced in coastal areas. 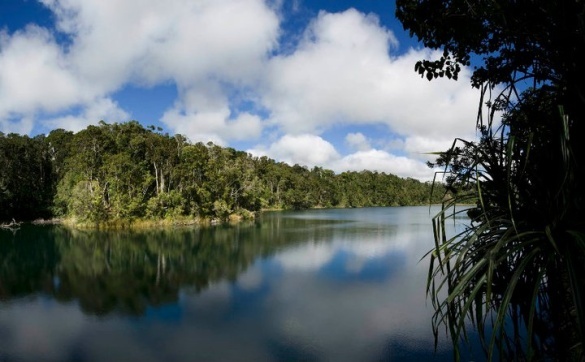 The World Heritage listed crater lakes - Barrine and Eacham - are the blue icons of the green Tablelands. Popular with visitors and locals alike. There is a huge range of visitor opportunities in this part of the world. 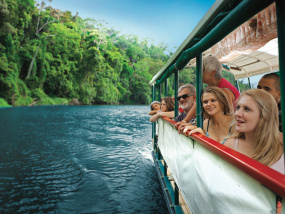 Scenic drives, rainforest walks, giant trees, boat cruises and plenty of wildlife. Both Lake Eacham and Lake Barrine have circuit walks around the lakes edge. 4.5 km for Lake Eacham and 6.5 km for Lake Barrine. 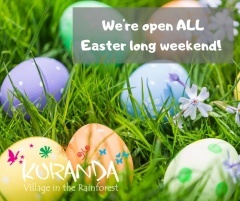 The walks provide an opportunity to experience remnant Tablelands rainforest and see some wildlife such as the musky rat-kangaroo and more than 100 bird species. There is a short walk at Lake Barrine to the 1,100 year old Twin Kauri Pines and at Lake Eacham there is a short 700m self guided walk from the picnic area. Lake Eacham is ideal for a picnic or barbecue and a swim in the deep clear water. 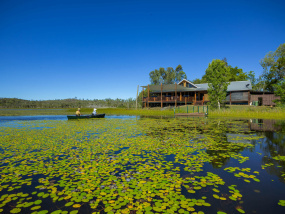 Lake Barrine is the place to go for a Devonshire tea or a light meal at the historic teahouse. The teahouse also offers regular guided boat tours of the lake. A great opportunity to see turtles, eels and water birds. Close to Lake Eacham is the magnificent Gadgarra Red Cedar, a grand survivor of the logging era in the late 19th and early 20th Centuries. 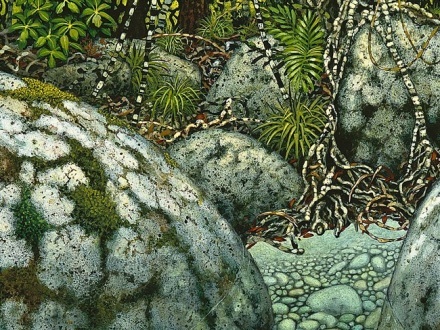 This forest giant is typical of the type of trees that were once common on the Tablelands. 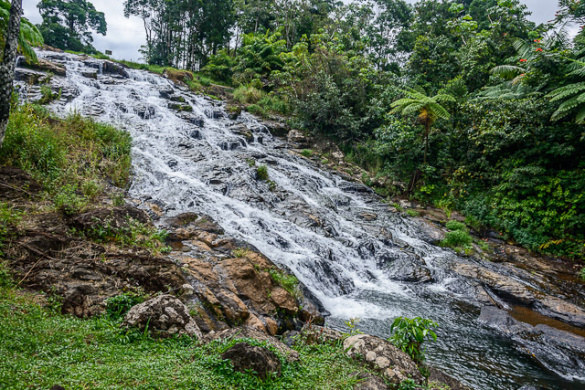 At the other end of town is the picturesque Malanda Falls tumbling over a basalt lava flow, filling the historic Malanda swimming pool. 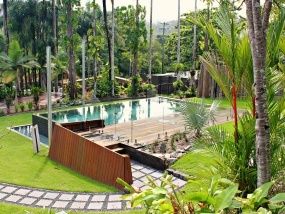 Here at this recreation area you can enjoy a swim, a picnic and a walk in the rainforest. The Falls also has an environmental information centre that features the volcanic history of the area and a cafe. Malanda is part of the traditional lands of the Ngadgon-Ji where they continue to play an active role in the local community. The Malanda Falls Environmental Centre features a Ngadgon-Ji display. 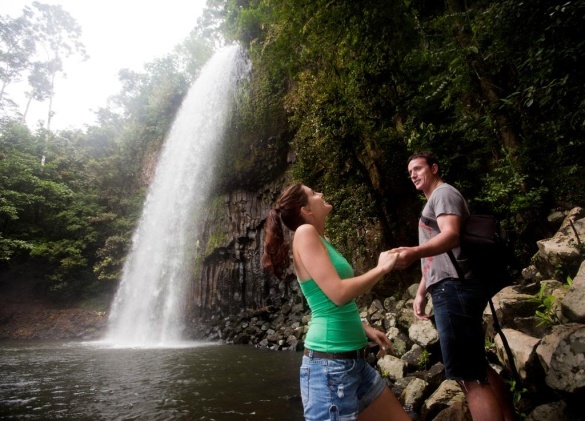 While in Cairns Highlands be sure to visit the Mungalli Falls, 13km from Millaa Millaa along the Palmerston Highway. Mungalli Falls is the highest waterfall on the Tablelands, approximately 90M high. It is a 15 minute walk from the top of the falls to the bottom, and there are swimming holes above and below the falls. At the Tea House beside Mungalli Falls you can buy country style lunches, Devonshire teas, snacks and drinks. Visitors and locals can take time out and enjoy a barbecue lunch at the popular "Platypus Park" which has been built on the surrounds of a local freshwater stream. 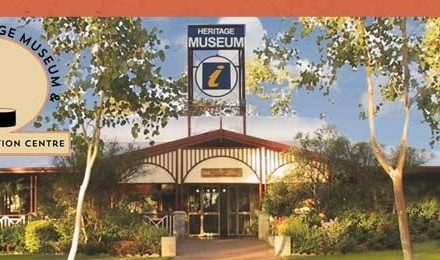 This park can be found on Herberton Road heading towards Herberton and is only 5 minutes out of Atherton. Barbecues are supplied for your convenience and the park has a fenced playground area. And of course don’t forget to see the main attraction at this park – the local platypus. Visit Mt Hypipamee National Park and see the Crater formed as a result of escaping gases blasting a vent hole clean through solid granite. The Crater is some 120 metres deep with a 70 metre pool of still water. Situated approximately 25 kilometres from Atherton on the Kennedy Highway. Whilst here take the walking track which will lead you to Dinner Falls and see the various mountain falls and enjoy a swim in the various swimming holes along the way. These Falls become the Barron River which flows into the ocean at Cairns. The Millaa Millaa Falls in the Cairns Highlands is the first of the three waterfalls on the Millaa Millaa Waterfall Circuit, 3km off the main road. Frequented by locals and tour groups alike as it is a popular swimming spot. You may even see the Ulysses Butterfly and Platypus late in the afternoon. There are many iridescent dragonflies that stay still long enough for you to be able to take a photo of them. There are plenty of parking spaces at these falls, shelter, barbecue and picnic facilities are available too. 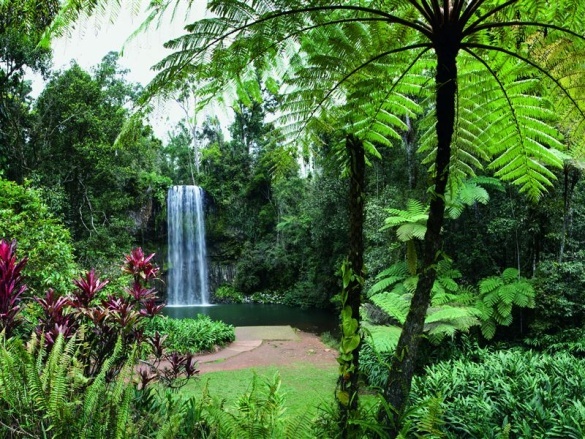 Millaa Millaa falls is one of the most photographed images in the Wet Tropics. Visit the cultural, spiritual, historical Rocky Creek Memorial Park, established in 1995 and situated on the site of the 2/2 Australian General Hospital laundry and medical stores site, at Rocky Creek adjoining the Kennedy Highway near Tolga. Several Army Divisions camped on the Cairns Highlands during 1942-45. Approximately 60,000 Australian soldiers were treated for war related conditions at these hospitals, by a caring and efficient staff of approximately 2,000. There are 63 military unit plaques. The units represented in the Memorial Park have an association with the Rocky Creek Australian Army Hospital or the troops that trained or provided unit support on the Cairns Highlands area during the World War II. There are three allied and community plaques displayed in this park, this area being established for Anzac Day 2001. 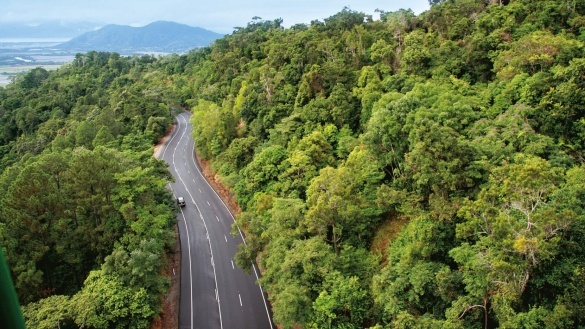 Take a tour by car through the natural rainforest of the Cairns Highlands. Throughout the trip you will also see plantations of pine and eucalypt trees, rainforest of the State Forest and Wet Tropics. 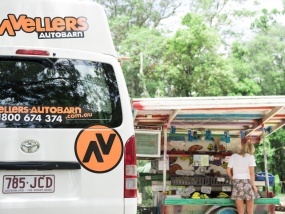 There are four ways to get to the Atherton Tablelands from the coast. Your choice of route will depend on where you are starting from, and what other attractions in Tropical North Queensland you want to see during your day. 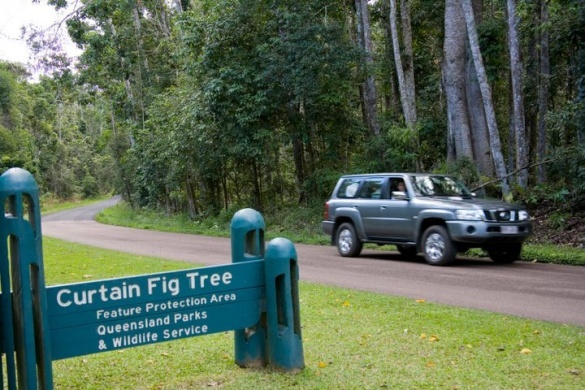 When travelling to the Atherton Tablelands from Cairns, there are two roads you can take. One begins at the southern side of Cairns, the other from the north. 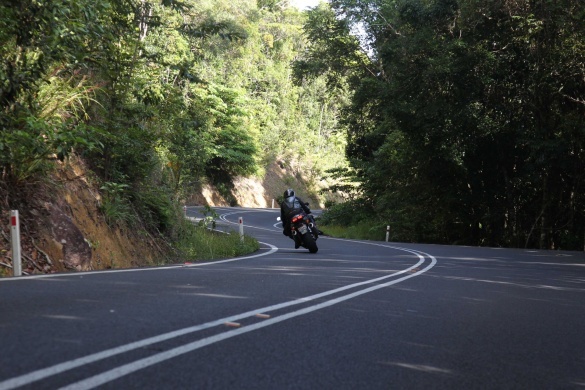 The Gillies Highway ascends the mountain ranges starting at the small town of Gordonvale. (24km south of Cairns). There is good signage along the way so it's difficult to get lost. 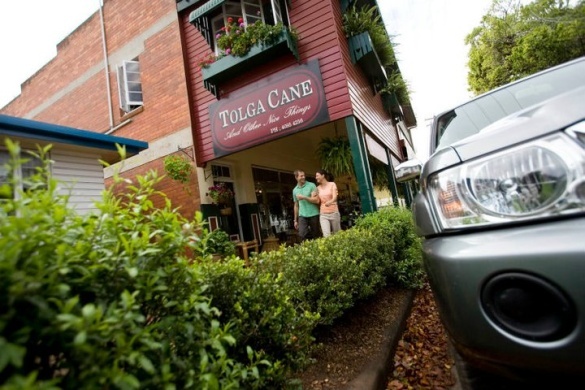 At the top of the range, you drive past the turnoff to Lake Barrine and Lake Eacham, until you arrive at Yungaburra. This range is only 16 kms long and takes approximately 35 minutes to travel. The views are magnificent, and the cool mountain air most invigorating. At the Smithfield Shopping Centre roundabout, a large sign will direct you to turn to the left. This is the very start of the Kuranda Highway. This gentle road is a pleasure to drive. 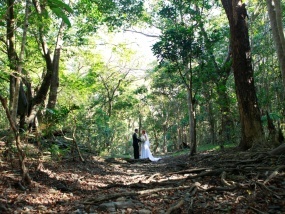 The rainforest is lush and green, and the views of the Coral Sea are spectacular. 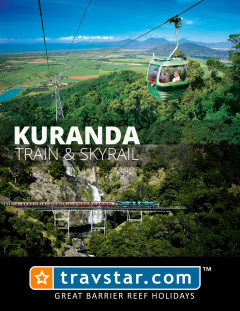 At the top of the range is the village of Kuranda, but if you continue on your drive you will eventually reach Mareeba. The flora along this road varies from thick rainforest to Australian scrub. If you intend to continue past Mareeba, you will turn left at the major intersection. This long straight road will take you to the tiny township of Tolga, and then onto Atherton or Lake Tinaroo. 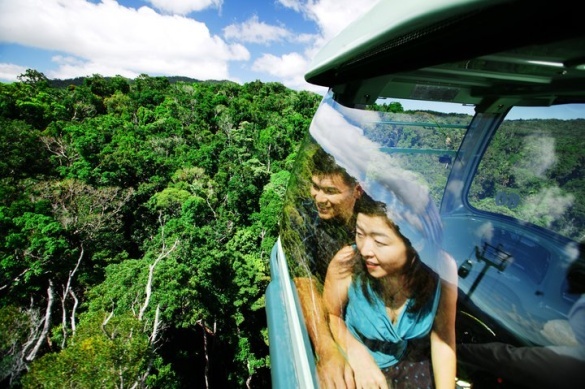 The Rex Range is regarded as the most beautiful ways to travel to the Atherton Tablelands. This road begins at the base of the mountains near Port Douglas (69km north of Cairns), so it is ideal if you're visiting Port Douglas in the morning and then intend to head up the mountains in the afternoon. Alternatively, you could make this trip in reverse. 12 kilometres north of Port Douglas, the Rex Highway takes you through the Mossman sugar cane paddocks before climbing the mountain to Julatten and Mt Molloy. Starting at Innisfail (93km south of Cairns), the Palmerston Highway stretches through Wet Tropics rainforests of Johnstone River Valley to Millaa Millaa. Picnic areas, waterfalls and camping grounds can be found along the way. Although this is the longest route from Cairns to the Atherton Tablelands, many people believe it is the easiest drive and the most scenic route. If you can allow about an hour and a half for travelling time, and are keen to see as much of the tropical north as you can, the Palmerston Highway may be a good choice for you. To reach the highway, drive south from Cairns through the cane fields and banana plantations until you reach Innisfail. At this town, good signage is located beside the main roads providing directions to the start of the highway. The highway is in very good condition so vehicles can maintain 100km/h for almost the entire length. 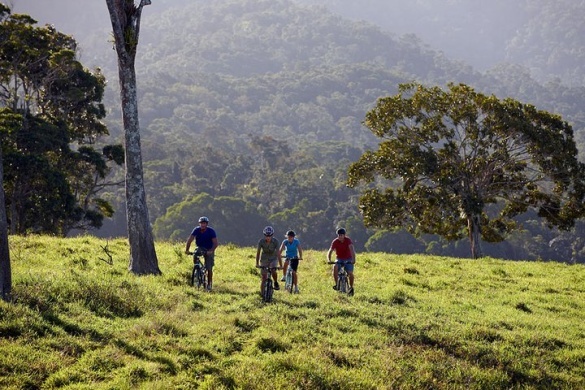 The Atherton Tablelands is Tropical North Queensland's highland getaway. This mountainous plain is nestled between the Bellenden Ker Range and the Great Dividing Range, at an altitude ranging from 600m to 1100m. The air is cool and fresh. The flora is perpetually green and lush. 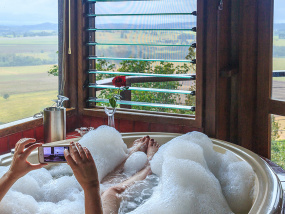 Despite being only 1 - 2 hours drive from the coastal town of Cairns, the Atherton Tablelands offer an escape from the modern hustle of city life. This is Australian countryside at its very best. Visitors to Tropical North Queensland often assume that the main attractions are found on the coast, or in coastal waters. 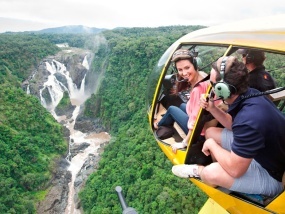 Destinations such as the Great Barrier Reef, Port Douglas and Daintree Rainforest, and attractions like Skyrail, white water rafting and wildlife parks are all routinely part of any tourist's itinerary. But many people forget that the mountains straddling Cairns hide a pristine environment that is every bit as special as the coastal strip. Chillagoe has ancient limestone caves. The Atherton Tablelands is home to World Heritage listed rainforests, national parks, mountains, rivers, lakes and waterfalls. It is also rated as one of the richest agricultural plains in Australia. 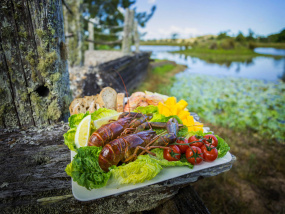 If you enjoy bush walking, bird watching, wildlife tours, hot air ballooning, water skiing, fishing, or just lazing around and enjoying the scenery, the Atherton Tablelands has something to offer you. 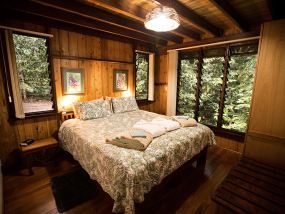 Accommodation at the Atherton Tablelands includes hotels and motels, bed and breakfast homes, backpackers, farm stays, and caravan and camping parks. 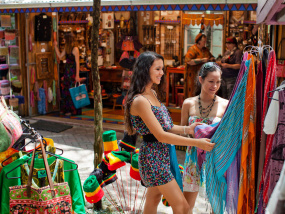 Fine dining restaurants are plentiful, and weekend country markets are a fascinating treat that the whole family enjoys. Every town has a special highland getaway. Brisbane has Toowoomba, Sydney has the Blue Mountains and Melbourne has the Dandenong Forests. Cairns is no exception. We have the Atherton Tablelands. 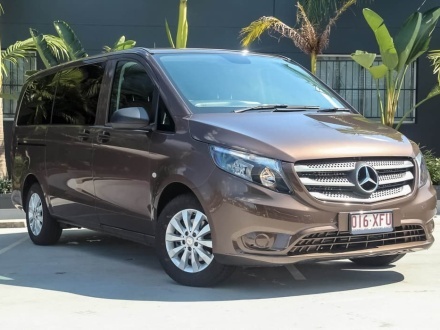 The Atherton Tableland is an ideal self-drive destination, and we are happy to assist you with car hire, should you be taking up this option. 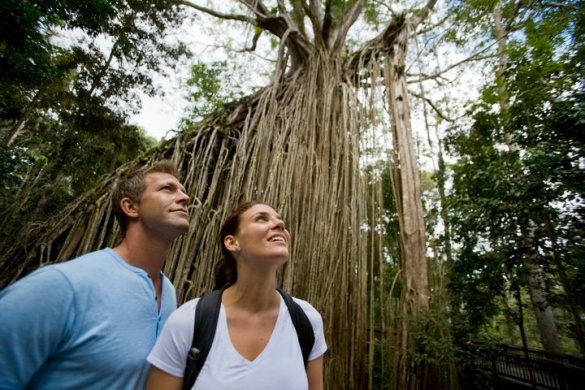 There are also an outstanding selection of Atherton Tablelands Tours which are better for travellers who only have a short time in the area. 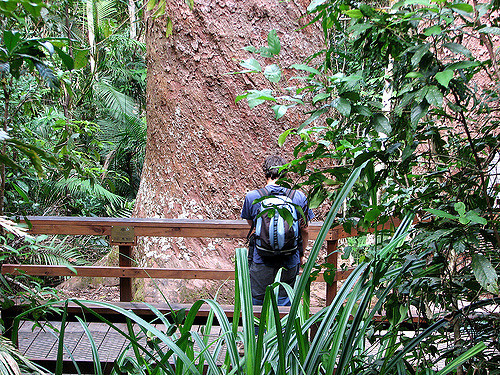 The Atherton Tablelands is an excellent area for bushwalking and hiking for many reasons. Not only is the climate mild and comfortable, but the diversity of forests - from dry scrub to wet rainforest - provides walkers with an array of choices. Depending on the length of a hike, multiple forms of forestry can be encountered. Many hikes throughout the Atherton Tablelands require a permit because national parks feature heavily across the landscape. However there are some other trails that are perfect for day-adventures and can incorporate children into the experience. A circuit track that leads from the dam wall along the top of a ridge and back to the wall is a challenging hike that takes approximately 2.5 hours. The beginning of this hike is very steep and children may have difficulty getting to the top of the ridge. But it is worth the effort because the views are spectacular. From Tinaroo Township, drive towards the dam wall and follow the road to the other side of the wall. On the left side of the road is a dirt car park where you can safely leave your vehicle. Walk approximately 50m back down the road and on the right side is a small wooden fence and a sign prohibiting the use of motorbikes on the trail. There are no other markings to indicate the presence of this trail. The end of the trail emerges onto a dirt road, and you need to follow this road to the left for approximately 200m. Pass over the cattle gate, and you'll be back at the Tinaroo Road. This is a 6km circuit track that follows the perimeter of Lake Barrine, suitable for all ages. It has a bitumen surface leading to a wooden viewing platform that overlooks two giant Kauri Pines that are over 1100 years old - a magnificent sight. The walk begins at the picnic and swimming area of Lake Barrine, which is beside the teahouse, and ends on the opposite side of the teahouse. We recommend you allow one and a half hours for the hike to give yourself time to read the informative displays along the way and appreciate the unique rainforest. Similar to the Lake Barrine Walk, the Lake Eacham perimeter walk extends for 4km around the crater lake. It features a bitumen surface, making it suitable for all ages and fitness levels. Along the way, hikers will see elk and staghorn ferns, strangler fig trees, wait-a-while palms and hundreds of tree ferns. The walk begins near the grassy picnic area on the banks of the lake, and ends at the turtle-viewing platform. The Kauri Creek Walk is a five and a half kilometre full circuit track, meandering through riverine vegetation along Kauri Creek. It then ascends through plantation pines and along a forestry road. The track is intended for intermediate to advanced walkers, although beginners can make the walk to the Red Cedar Tree (located one kilometre along the track) before returning to the picnic area. For more information about hiking and bushwalking in the Atherton Tablelands, contact The Tablelands Walking Club. Hike on marked trails and walk single file to prevent damage to plants and trees. Do not light fires in the forest. Carry out all rubbish, including vegetable matter. Do not take dogs on hikes, unless you are able to keep them under strict and close control. Kangaroos, bandicoots and snakes are tempting chase-targets for dogs. Be aware, however, that dogs are forbidden on some tracks. Atherton Tablelands history is a rich, and at times convoluted, story of hardship and battles against the odds. As you enjoy the tranquillity and beauty of this region, it's hard to imagine the kind of difficulties that early settlers experienced. The history of settlers at the Atherton Tablelands is traced from its beginning in 1875 when it was discovered by the explorer and prospector, James Venture Mulligan. He was passing through the area on one of his many expeditions in search of fertile lands and valuable minerals such as gold and tin. Of course, Aboriginal people had inhabited this land for tens of thousands of years prior to Mulligan's arrival, and this history is explained in Aboriginal History in the Atherton Tablelands. While Mulligan was passing through the Atherton Tablelands he met a pioneer grazier, John Atherton, from whom the name of the region is derived. Mulligan informed Atherton of tin deposits in the area now known as Herberton, who then passed this knowledge further to another party of explorers headed by John Newell. These men formed an alliance, forming the pioneer town of Herberton. For tin mining to be successful, a track needed to be carved through the jungle from Herberton to the main shipping terminal on the coast, Port Douglas. Workers toiled under harsh conditions, combating wild animals and tropical diseases. The track, when finished, passed through the present Main Street in Atherton. Bullock teams hauled food and other essential supplies up and down this road to sustain the mining community at Herberton. This track was also used to drag lumber to the coastline and establish a major timber industry. The township of Atherton, originally called Prior's Pocket, formed from the temporary camp that sheltered men as they travelled along the Herberton-Port Douglas track. The growth of the timber industry also meant that felling occurred throughout the Atherton Tablelands, so men were often stationed along the track for extended periods of time. Atherton officially became a town when the first lots were sold on 23rd February 1886. Life for European settlers (British Isles, northern Italy, Germany, Middle East, Greek, Albanian, Sicilian, Swiss, French) in the Atherton Tablelands was spent either mining for tin or gold, or lumbering. Along with Europeans, many Chinese, Malaysians and Indians came to work the land. The Chinese, mostly market gardeners, were on the lookout for opportunities to grow maize, and found prime conditions at the Atherton Tablelands. Up until 1919, Chinese were responsible for approximately 80% of all maize harvested in the region. Atherton had a Chinese population of more than 1000, with it's own Chinatown and Chinese temple. 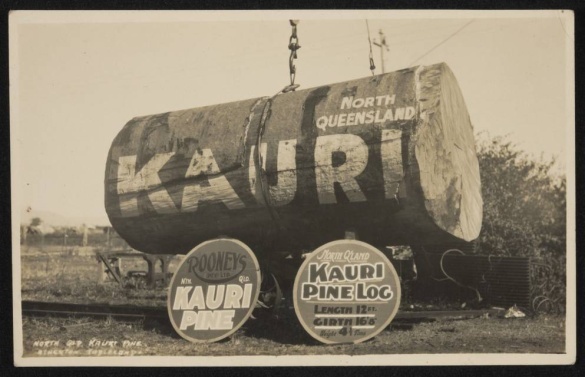 The timber industry grew into a major force throughout the Atherton Tablelands, with Kauri Pine and Red Cedar being the prized timbers. Trading firm, Burns, Philp & Co. Ltd., developed the idea of floating logs down the Barron River in a similar manner to Canadian lumberjacks who floated logs down the Fraser River. An experiment was arranged to float eleven logs down the Barron River to the coast, and they all successfully arrived with little damage. This success encouraged the timber companies to chop down as much cedar as they could before the wet season, when the rise in water levels would rush the timber to the coast. Unfortunately that year the wet season was tremendously heavy and the Barron River swelled so high that most of the logs wre stranded in backwaters on the edge of the river. When the river levels dropped, the logs were scattered for hundreds of miles all the way from Tinaroo to Smithfield. The few logs that did make it to the coast were badly damaged as they passed over the mighty Barron Falls. The fiasco was deemed a total failure and was never attempted again. In 1925, access to the Atherton Tablelands was thrust open to the world with the construction of the Gillies Highway. For the first time, it was possible to drive from the coastal strip to the Atherton Tablelands, and back, in one day. The road was one-way only, so lengthy delays were often experienced at both ends. Atherton's water supply was completed in 1929, and was upgraded by a pipeline from the Barron River in 1956. In 1955, the Queensland Irrigation and Water Supply Commission commenced the construction of Tinaroo Dam on the Barron River. Located about 10 miles from Atherton, the purpose of the dam was to provide irrigation for tobacco farms in the Mareeba-Dimbula area, and to prevent millions of litres of water flowing down the Barron River to the sea every wet season. The concrete irrigation channels brought a guaranteed water supply to almost 100 000 acres of undeveloped land that could now be used for farming. This was a tremendous boost to the economy of the region. The dam was the first one of its size built in Queensland. The capacity of Tinaroo Dam is approximately three-quarters of the volume of Sydney Harbour long with a spillway of 250 feet. 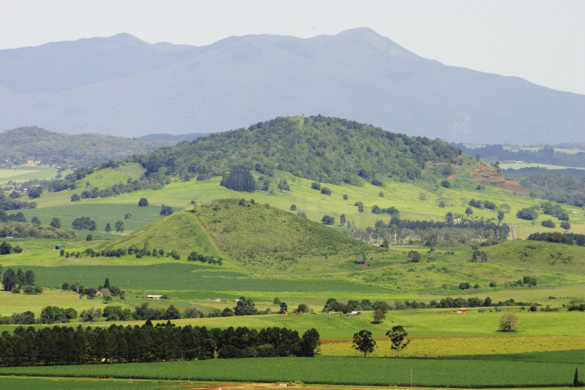 Today, farming is still the major industry at the Atherton Tablelands. Sugar cane, corn, maize, beans, strawberries, macadamia nuts and lettuce have replaced tobacco farms as primary industries. Cattle grazing and chicken rearing are also major industries. The Atherton Tablelands has also grown into a popular tourist destination, with Tinaroo Dam being the focal point. 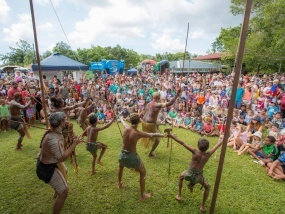 The history and culture of the Australian Aboriginal people stretches back for tens of thousands of years, and the Atherton Tablelands is an important part of this history. Although modern day historians are largely uninformed about indigenous history prior to European contact, we do have records about the impact of white settlement on the Aboriginal lands, the conflicts that resulted, and the rules and inequalities forced upon the native people. The story of Aboriginal history in the Atherton Tablelands since 1884 is bleak, showing the catastrophic deterioration of a strong culture that once thrived in this mountainous region. As described in the general history of the Atherton Tablelands, white settlers first established villages and towns in the area in 1886. For two years prior to this, explorers had been searching the area for viable economic resources such as timber, tin and gold. These explorers had come in contact with Aborigines and displayed a distinct lack of grace and understanding for their ancient culture. Conflict between the two groups became intense and the killing of cattle and crops in acts of retaliation by Aborigines became economically unbearable for white settlers. Indiscriminate killings of Aboriginal people resulted, creating a gulf of animosity between white and black. In desperation at losing their economic interests (cattle and crops) the settlers near Atherton pressured the government into conciliating the rainforest Aborigines. 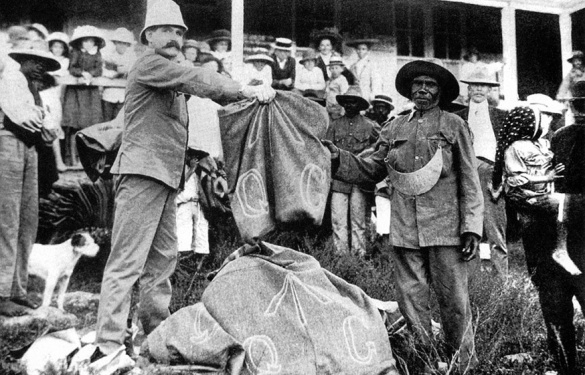 In early 1889, a police constable aided by Aboriginal interpreters made contact with the resisting rainforest Aborigines and coerced them into a truce: If the Aborigines ceased attacking the white folk, the settlers would return the favour and supply them with food. This strategy was successful in stopping the violence between white and black people, but it did not halt the downfall of the Aboriginal way of life in the area. To the contrary, some anthropologists have suggested that the nullification of Aboriginal resistance took away their only method of defiance to European invasion of their land. From 1897 to 1971, the 'Restriction of the Sale of Opium and Protection of Aboriginals Act' was created with the purpose of looking after the perceived interests of Aborigines. This act authorised committing aborigines to a reserve and detaining them there against their will, and permitting the forced separation of husbands from wives, and children from mothers. Specific justification for these actions was not required - the word of the white man was apparently more trustworthy and educated than the black man. These events fractured families and altered the courses of many young Aboriginal lives. 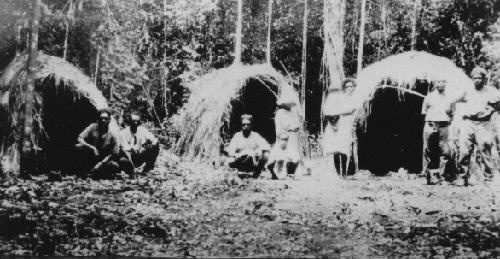 By Federation in 1901, some Aboriginal men living at the Atherton Tablelands were employed on the land felling timber, erecting fences and working stock. Women were often employed by a family to help with domestic chores. In the 1920's and 30's and again in the 1950's and 60's, a tourist display was held in the Malanda displaying the local skill of tree climbing and some cultural traditions. During these years, however, the wages of Aboriginal workers was strictly controlled and divided between landowners, local authorities, and the Aborigines themselves. Allocation of wages was determined on marital status, age, and whether an Aboriginal was full-caste or half-caste. In the first half of the 20th century, the ideal of Aboriginal missions as a way of "saving" the Aboriginal people from "themselves" was in full swing. People were sent compulsorily to missions at Yarrabah (Cairns), Monamona (near Kuranda), Palm Island (Townsville) and Woorabinda (Rockhampton). The missions aimed to protect some aboriginals from murderous reprisals by white landowners, but the unintended consequence was the further damaging of Aboriginal culture by discouraging language, tribal tradition and in some instances, family ties. The result of the past 120 years is a sad indictment of one culture controlling another. Less than a handful of Aboriginal families remain in the Malanda area, even though some who were sent away to missions did return to their homeland when released. There are few surviving speakers of the indigenous Atherton Tablelands language, Ngadjon. 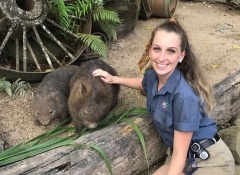 The plants and animals living at the Atherton Tablelands are every bit as magical as their cousins in more prominent areas such as the Daintree Rainforest and The Great Barrier Reef. In fact, the Atherton Tablelands are included in the 1988 World Heritage Listing with these two other major tropical ecological areas. The natural beauty and fragility of the ecosystem throughout the entirety of Tropical North Queensland is one of the most pristine in the whole world, and the Atherton Tablelands is a vital part of this make up. This remarkable composition of plants and animals makes the Atherton Tablelands prime territory for bird watching and ecological activities. A vast amount of biological research is conducted throughout the region, and the list of plant and animal species, and benefits that come from the rainforest, grows larger every day. The diversity of plant form throughout the Atherton Tablelands means the type of forest you are travelling through can suddenly change from rainforest to dry scrub in the space of a few kilometres. An example of a small pocket of forest, unique to a limited area, is the Tolga Scrub. This is one of the last remaining fragments of the endangered Mabi rainforest. It once covered areas north and west of Malanda, but is now limited to only 26 hectares (65 acres) near the small town of Tolga. The scrub is 2 kilometres long and only 100 metres wide, bordered by a highway, railway line and other man-made infrastructure. Despite being the most drought resistant type of rainforest in Australia, scientists are concerned that human activity will threaten the survival of the unique Tolga scrub. Widespread clearing has resulted in several endemic plant species being listed as 'vulnerable to extinction'. 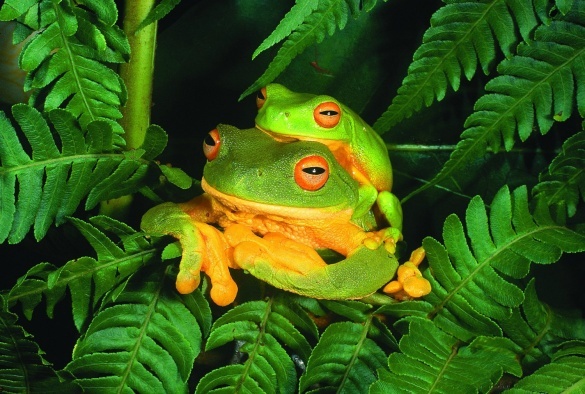 The history of flora and fauna in the Atherton Tablelands stretches for millions of years into the past. From 3 million to 20,000 years ago, extensive volcanic activity occurred leaving hundreds of conical hills, flooded craters, scoria cones, lava cones, maars of irregular distribution and red soil that is excellent for agriculture. Extinct remnants of volcanos can be found near Atherton, at the Seven Sisters hills, and crater lakes are found at Lake Eacham and Lake Barrine. Scientists believe these lakes were formed approximately 12,000 years ago when molten hot magma in the centre of the earth rose to the surface and heated the water table. The intense hot steam resulting from the boiling water table was trapped underground until massive explosions facilitated its release. Huge cracks appeared in the ground and the trees that once lathed the mountainside were levelled and burnt. 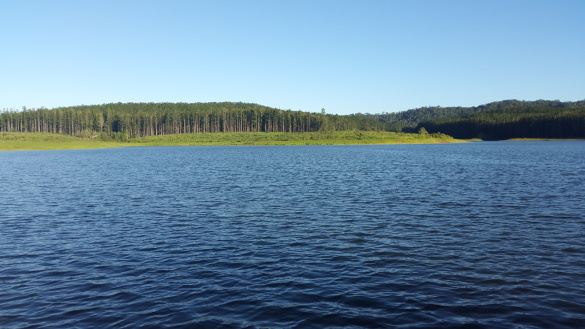 Eventually, over hundreds of years, water filled the craters and the trees grew back to create the tranquil lake used today by families and tourists for recreation. The lake is fed by underground springs so it retains a constant water level and is unaffected by drought. Trees surrounding the lakes grow to 55 metres high. The lakes and creeks at the Atherton Tablelands are home to a great diversity of freshwater fish. 78 of Australia's 190 species occur in these waterways, and the most common fish family is the Rainbow Fish. Waterfalls create natural barriers to fish migration, meaning that some creeks have isolated subspecies of fish that are found nowhere else in the world. This is a phenomenon called endemism, and is of particular concern for scientists because the pollution and destruction of a single waterway can lead to the extinction of a subspecies. However, there are always exceptions to the rule, and Lake Eacham (a closed volcanic crater filled with water and isolated from all other watercourses) is the centrepiece of this unusual story. The Lake Eacham Rainbowfish (Melanotaenia eachamensis), which is very similar to the Eastern Rainbowfish, somehow found its way into the volcanic lake many hundreds of years ago. Scientists are unsure how the fish entered the waters of Lake Eacham. Unfortunately for the small brightly coloured fish, humans introduced larger native fish into Lake Eacham and these bigger fish ate the Rainbow Fish into extinction. However, it was soon revealed that hobbyists had been illegally collecting the Rainbow Fish from Lake Eacham and successfully breeding them in captivity. These private stocks of Rainbow Fish because the source for monitored breeding to reintroduce the fish to the lake. But alas, the same large fish that ate the Rainbow Fish to extinction was still living in Lake Eacham and proceeded to wipe out the new stock in the same manner as it had previously. A few years later, researchers working in Wet Tropics rivers and creeks found genetically identical versions of the Lake Eacham Rainbow Fish in the Tully, Herbert and Johnstone Rivers and Dirran Creek. How these fish entered these rivers from the closed Lake Eacham system is a mystery that scientists are still working to solve. 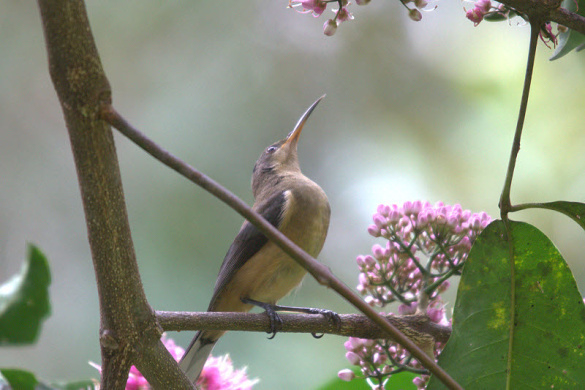 Birdlife in the Atherton Tablelands is diverse. A small selection of birds commonly seen may be found below. Cairns Highlands - What's in a name? 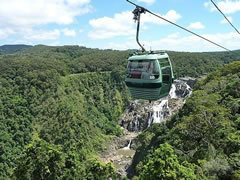 In July 2003, Tropical Tablelands Tourism introduced a new marketing name to re-brand the Atherton Tablelands as being proximate to Cairns, with a mountainous airy image of cool, tropical and green, and decided upon the name Cairns Highlands. While the reaction has been mixed from locals and residents, many businesses have embraced the new name with gusto, incorporated it into their products, and even registered trademarks. 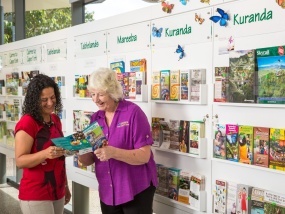 The idea to re-brand the Atherton Tablelands as Cairns Highlands came about as a result of a federally funded tourism strategy report which was compiled by a panel of tourism industry experts from across Australia. The tourism strategy looks at ways to sustain the tourism industry into the future by considering the resources and facilities available, other opportunities that may exist to expand tourism, and marketing directions. 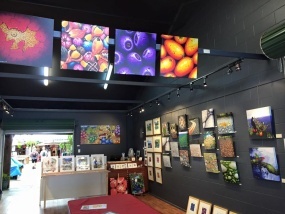 According to Senator Ron Boswell, the report recommends that the region markets itself as the ‘Cairns Highlands' to capitalise on the Cairns name which is familiar to most tourists. 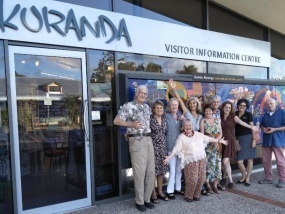 "Hopefully this will lead to an increase in the number of visitors to the Tablelands and the length of time that they stay in the region," he said. "The Tablelands will always be known as ‘The Tablelands' to locals, however the ‘Cairns Highland' name will be a new brand that the tourism industry can use to market their products and get a bigger slice of the tourism pie up in Far North Queensland." Introducing the Tablelands Region - taken from the Tablelands Community Plan 2021! The Tablelands Regional Council was formed in March 2008 as a result of the amalgamation of the former Atherton, Eacham, Herberton and Mareeba Shires. The Tablelands is a diverse region, covering an area of 64,768 km2 - larger than the main island of the State of Tasmania - and home to 46,937 people (estimated resident population at 30 June 2010, ABS 2011). The main population centres on the Tablelands are Mareeba, Atherton, Malanda, Herberton, Kuranda, Ravenshoe, Millaa Millaa, Chillagoe, Dimbulah, Mt Garnet, Mt Molloy, Tinaroo and Yungaburra. The region spreads westwards and southwards from the coastal escarpment behind Cairns and incorporates parts of the Wet Tropics bioregion to the east, the Einasleigh Uplands to the south, the Gulf Plains to the west and the Cape York Peninsula bioregion to the north. 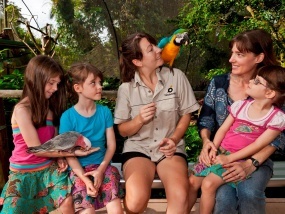 The Wet Tropics World Heritage Area lies within the region’s eastern boundaries. The Tablelands region is situated in the vicinity of 160 - 170 south latitude. 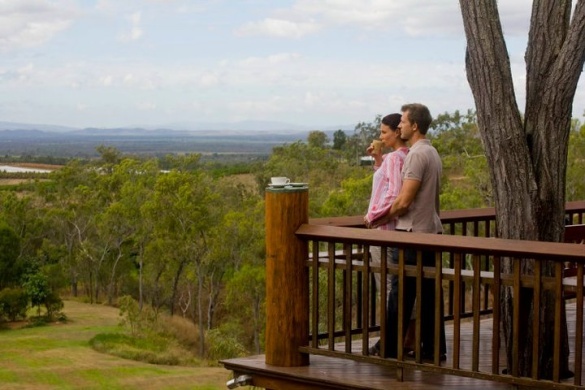 Its elevation above sea level ranges from about 400 metres in northern areas around Mareeba to 1,280 metres in the southern areas encompassing the former Herberton and Eacham Shires. The mountainous region in the east reaches heights above 1600m, including Queensland’s highest mountain Mt Bartle Frere at 1622m. Because of its altitude, the region does not suffer from temperature extremes or the high humidity experienced in coastal areas. The northern part of the region enjoys cool, dry winters and warm, wet summers with minimum daily temperatures in winter rarely falling below 15oC and maximum daily summer temperatures rarely exceeding 35oC. To the south, rainfall is much higher with the area around Topaz recording some of the highest annual rainfall in Australia. Temperatures are also lower with a range of between 17oC and 25oC from September to June and between 5oC and 14oC from July to August. The considerable range in elevation, rainfall and soil types has produced an incredibly diverse and beautiful region. There is a prolific diversity in natural flora and fauna, ranging from tropical highland rainforests to dry tropical savannah. Water, soils and diverse growing conditions have supported development of a wide range of agricultural and horticultural cropping operations. The region’s farmers and support services represent, in most cases, best international practice in farming in a tropical environment. Water supplied from Tinaroo Dam enables a tremendous range of fruit and vegetables to be grown to supply both the domestic and overseas markets. The range of crops grown is truly amazing and includes avocados, bananas, cashews, citrus, coffee, cow pea, custard apples, dolichos, flowers, fresh herbs, grapes, grass seed, legume seed, lettuce, longans, lychees, macadamia, maize, mangoes, mixed vegetables, navy beans, potatoes, passionfruit, paw paw, peaches, peanuts, pineapples, pumpkins, sorghum, sugar cane, sweet potatoes, ti tree, tomatoes, native trees, turf and watermelons. The cattle industry also plays a significant role in the region’s economy and in recent years the value of animals produced in the region has been approximately $35 million per annum. To the south, around the Malanda/Millaa Millaa area, the dairy industry is significant and the Tablelands dairy industry is the only tropical dairy industry in Australia and one of the few globally. Other agriculture based industries include poultry, fruit wineries, aquaculture and timber. 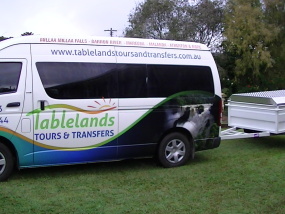 With its remarkable scenic qualities, the Tablelands Region is a popular tourist destination. Visually the region is stunning. It encompasses a myriad of waterfalls, broad mountain vistas, clear mountain streams, crater lakes, National Parks and freehold pristine rainforests, popular and attractive villages such as Kuranda and Yungaburra oriented to tourism, rich outback savannah wetlands teeming with bird life, historic mining towns, limestone caves, rich farming vistas and stark outback scenery reminiscent of Cape York and Kakadu. The Tablelands’ history and landscape includes our rich and robust Aboriginal heritage. With its location within a World Heritage Area, adjacent to an international airport and within a region that is already a destination for some 2.2 million visitors per annum, it has unrealised tourism potential. 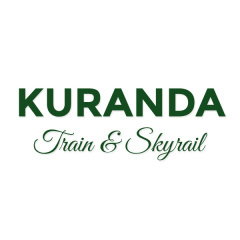 Kuranda alone, with the Kuranda Scenic Railway and Skyrail Cableway, brings up to a million visitors to the region each year. Tinaroo Dam is a further drawcard, bringing an estimated 500,000 visitors per annum to utilise the Dam for water skiing, boating, fishing and camping. 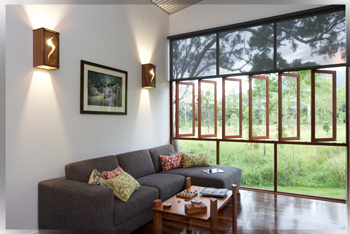 In recent years there has been a rapid expansion of high quality Bed and Breakfast properties which allow visitors to experience the unique attractions of the Tablelands first hand. The area is also a popular destination for Grey Nomads who hold a Christmas in July event at Mareeba each year. The Tablelands region is rich in mineral resources including gold, lead, zinc and other base metals, tungsten, copper sulphate, tin, perlite, limestone, marble and slate, and there are a number of major mining operations within the region. Overall, with its natural beauty, economic diversity, abundance of water, proximity to Cairns and potential for significant expansion in terms of agriculture, tourism and mining, the Tablelands region has a secure future. 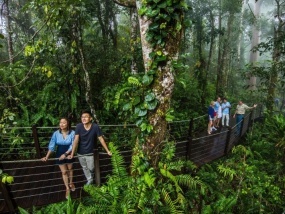 The region will continue to be a lifestyle destination of choice for many “tree changers” leaving the cities in search of a quieter lifestyle or for those people who are simply attracted to the natural beauty of the region, its mild tropical climate and its relative proximity to Cairns (with its domestic and international airports). As well, a focus on establishing Mareeba as the industrial hub of Far North Queensland and the further development of the Mareeba airport, which has the potential to become a major regional centre in North Queensland’s fast growing general aviation industry, will provide strategic infrastructure which will help fuel sustained economic growth into the future.